Polymers have become increasingly important components of cosmetics over the past few decades. The original uses of polymers in hair care were as fixative agents and viscosity controlling additives; however, new polymers today are also used for hair conditioning and for the development of new style control products. 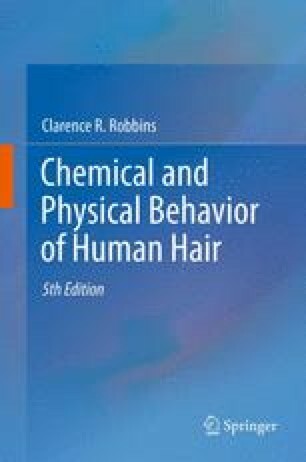 Polymer substantivity to hair fibers increases with molecular size, with an increasing number of polar group attachments and especially with an increasing number of cationic groups for attachment to the negatively charged surface of hair fibers. From an anionic shampoo medium the cationic charge on polymers is neutralized and the adsorbing species is essentially a neutral or negatively charged species. The most successful silicone conditioning polymers for hair care have been used in both shampoo and conditioner compositions. Dimethicones in shampoos condition undamaged or lightly damaged hair better than they condition highly damaged, bleached hair or even tip ends because neutral hydrophobic conditioning agents adsorb more readily to an undamaged hydrophobic surface than to a damaged highly polar hair surface. New block co-polymers and a fairly large number of new cationic polymers have been introduced into hair care recently, while fractal polymers (highly irregular shapes) and nanoparticles have been developed and are receiving attention for potential use in hair care.